Banana fritters conjure up memories of childhood. Sunday afternoons were the times where mum would do a session of deep frying - banana fritters, prawn crackers, taro, sweet potato fritters - it was a deep-fry fest! Here's my recipe for banana fritters. I don't have an exact measurement for the water to be added, but I think you need to just get a feel for the right consistency of the batter. You'll just know! The batter is nice and crispy, and is slightly salty, but I think it's a good match with the sweet banana. I used regular bananas, but you can use sugar bananas if you want a sweeter fritter. Make a well in the centre, and slowly add a little water while mixing the flours into the well. Mix to make a thick, smooth mixture, then add more water to bring the mixture to the right consistency. Heat the oil up in a wok to 175°C (use a thermometer). Put the banana pieces in the batter mixture and carefully place the pieces into the oil. Serve with a side of condensed milk. 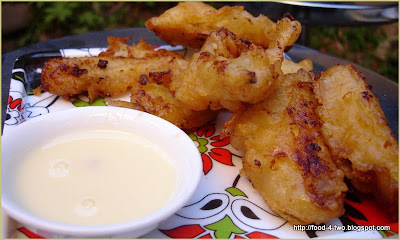 Loved banana fritters (or goreng pisang) ever since I first tried it in Malaysia! I love fried foods. I've heard a lot about bannana fritters (from blogs) but have never had them before. These look so good!